Thanks to soaring property values and new flagship office developments, the value of all real estate in Santa Clara County has hit $419 billion. That is $30.9 billion more than 2015 (7.9% increase). 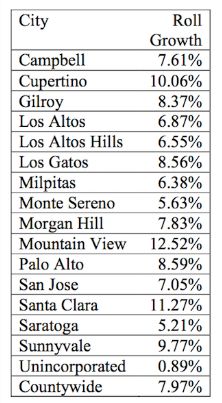 The biggest increases in assessed property value came from Mountain View, Santa Clara, and Cupertino (due to Apple Campus II). San Jose proper appreciated at a respectable 7% which unincorporated parts of the county saw the least appreciation at 0.89%.